It's all about FUN here at Mommy's High Heel Shoes. Check out some of the upcoming in person events as well as fun stuff for kids. 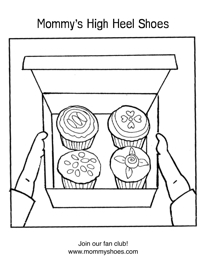 Just print 'em off, grab your crayons, and get ready to color pages right from the book. To print: Click on the image below. 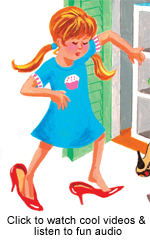 Here is a sneak peek at the digital version of Mommy's High Heel Shoes. The music was composed by Hollywood's grammy nominated Stephen Edelman. Go to MOBISTORIES.COM to download and use the code: MHHS to receive 25% off your order. When you order the hardback book on our site, we'll send you a 50% off code! Click the image to check out some cool stuff from around the web. Can enter our monthly contests for fun prizes! Receive shopping coupon codes for our online store. Receive e-mail newsletters 1-2 times per month. We are updating our calendar and adding new events each day. Please check back to find out where we'll be and contact us at sales@mommyworkshop.com to schedule your own fun event. December 18th Kristie will be joining Authors Jonathan McSurdyand William Bentrim for a special picture book event at the Warrington, PA Borders. from 7:00-9:00 pm. Meet the Author, Kristie Finnan, who will be signing books at the Bucks County Designer House on Friday May 8th and Friday May 22nd- which Benefits Doylestown Hospital and Village Improvement Association of Doylestown Community Projects. May 2nd and 3rd, Kristie Finnan will be at Canterbury Tales Bookshop in Peddlers Village- Lahaska, PA signing books at the Annual Strawberry Festival.The Festival is the weekend before Mother's Day. Celebrate your Mom and stop by to pick up an autographed copy of Mommy's High Heel Shoes. April 3rd & 4th Society of Children's Book Writer's and Illustrator Pocono Conference at the Inne at Shawnee. Kristie Finnan will be selling and signing all copies of her book! If you would like to book an event please e-mail the details to Author@mommyshoes.com . Author, Kristie Finnan, is available for speaking engagements at Schools, Childcare Centers, Girl Scouts, Mommy Groups and Corporate Working Mother Events. we are booking into 2009/2010 school year.